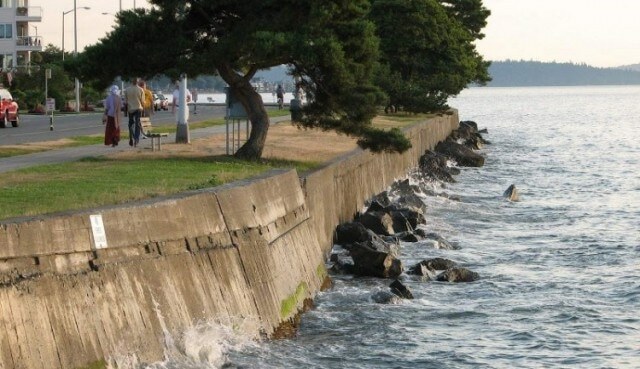 Bulkheads and seawalls along the shores of Puget Sound help ease erosion and stabilize bluffs to protect waterfront properties. But these walled structures also shrink beaches, reduce habitat for invertebrates and spawning fish and, indirectly, degrade conditions for iconic species like salmon and orcas. Many studies have shown this pattern at seawall sites around Puget Sound. A new University of Washington study shows that impacts at individual armored sites can scale up to have cumulative, large-scale effects on the characteristics of Salish Sea shorelines and the diversity of life they support. It is the first study to analyze sites broadly within Puget Sound and offers the most comprehensive look to date at the impacts of shoreline armoring on the Salish Sea ecosystem. “Given the incredible variety and complexity of shorelines in the Salish Sea, to pick out patterns we had to go very broad and step back and squint, if you will,” said lead author Megan Dethier, a research professor of biology at the UW’s Friday Harbor Laboratories. The paper appeared online this month in the journal Estuarine, Coastal and Shelf Science. When researchers looked at sites from south, central and north Puget Sound, the data showed that armored beaches became slightly narrower and steeper over time, and larger pebbles replaced finer-grained sediment and sand. Additionally, in stretches of shoreline that were more heavily armored, even the unarmored areas showed similar impacts — less sand and more larger sediment on the beach. Of Puget Sound’s 2,500 miles of shoreline, more than one quarter are currently armored. Shorelines range from heavily armored, concrete-covered commercial ports to pristine, sandy beaches. Erosion from bluffs and banks is a natural process and if left alone, most bluffs will erode and replenish the beaches with sand and gravel. Armoring stops or dramatically slows erosion, and gradual-sloped, wide, sandy beaches over time give way to pebbly, steeper shorelines that aren’t desirable to beach-spawning fishes — or humans. “This new report by Megan and her team provides crucial information on shoreline armoring impacts that will be highly valuable in improving our management approaches to Puget Sound shorelines,” said Randy Carman, who works with the nearshore habitat program at the Washington Department of Fish and Wildlife. In addition to identifying cumulative effects, this paper also confirmed previous studies and observations that armoring impacts the ecology and structure of shoreline habitat in Puget Sound. Specifically, armored beaches generally have fewer drift logs, algae, seagrass and other organic debris that naturally washes ashore than their unarmored counterparts. This vegetation provides a daily feast for crustaceans and insects, and indeed, fewer invertebrates were present at armored sites. Sandy beaches, which provide habitat for surf smelt and other forage fish to spawn, were replaced by coarser sediment in armored areas. Ultimately, all of these changes in nearshore habitat probably alter the feeding and migration patterns of juvenile salmon in the Sound. In designing the study, Dethier and her collaborators identified 65 pairs of sites around the Salish Sea. Each pair included one site with no shoreline armoring and another close by that had some degree of armoring such as bulkheads, seawalls or wood pilings. Additionally, each pair was within a distinct unit of shoreline, called a drift cell, and the percentage of armored shoreline in each drift cell varied. They collected detailed data from each site, including the amount of natural debris (seagrass, algae); the number of logs deposited on shore; the presence of invertebrates such as insects and sand fleas; the size of beach sediment, ranging from sand to cobble; the amount of vegetation hanging over the shoreline; and the slope of each beach. They found the effects of armoring were cumulative, because in shoreline drift cells that had a higher percentage of armoring, even unarmored sites showed impacts, including less sand and more larger sediment. The data collection was exhaustive, Dethier said, and a single day in the field generated about three weeks of processing specimens in the labs — all before data analysis even began. Because the effects of armoring are cumulative, it follows that reducing the number of bulkheads and seawalls throughout Puget Sound would improve the overall health of the ecosystem. Replacing concrete walls with softer, greener materials like logs, or replenishing armored beaches manually with truckloads of sand and gravel are options to lessen the impacts. Even moving a seawall higher up on the shoreline would allow space for forage fish to spawn and natural tides to bring valuable nutrients to shore. Many scientists agree the best option is to avoid putting in any new bulkheads and seawalls, which is what Hugh Shipman, a coastal geologist with the state’s Department of Ecology, advocates in his work with landowners. Current laws for new armoring are set by the Department of Ecology under the Shoreline Management Act, and local governments are in charge of regulating and approving projects, with additional permitting from Washington Department of Fish and Wildlife. Other co-authors are Wendel Raymond, formerly at Friday Harbor Laboratories and now at the University of Alaska, Fairbanks; Jason Toft, Jeffrey Cordell and Sarah Heerhartz of the UW’s School of Aquatic and Fishery Sciences; Andrea Ogston of the UW’s School of Oceanography; Aundrea McBride of the Skagit River System Cooperative; and Helen Berry of the Washington Department of Natural Resources. This research was funded by Washington Sea Grant and the U.S. Environmental Protection Agency, through the Washington Department of Fish and Wildlife.